"IF MY PEOPLE, WHICH ARE CALLED BY MY NAME SHALL HUMBLE THEMSELVES AND PRAY, AND SEEK MY FACE, AND TURN FROM THEIR WICKED WAYS, THEN I WILL HEAR FROM HEAVEN, AND WILL FORGIVE THEIR SIN, AND WILL HEAL THEIR LAND"
Praise the Lord Jesus Christ! As of today, I have prayed with 84 people to recieve the Lord Jesus Christ into their hearts as their Lord and Saviour of their life! 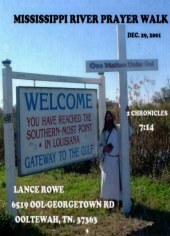 On December 29, 2001, I began my Journey up the Mississippi River. Since then I have only been able to walk a little more than 30 miles, because of all the souls I have been priveleged to minister to. I want to share some highlights here from my journal. Before I began my walk, I and my family stopped to pray. After I prayed for the Lord's blessings on this journey, I blew my shofar, asking the Lord to station His angels at the mouth of the Mississippi. Shortly after I began my walk, a man pulled up beside me in a pickup truck. He was talking on the phone, telling his wife, “Yeah, he looks like Jesus and he is carrying a big cross.” He told me that he was describing what he was seeing to his wife. I told him what I was doing, and handed him a tract. I asked him if he was born again, and he said he was. I told him we need to be ready. I spoke to quite a few people who were parked beside the road, fishing. I prayed for all who would allow me to pray for them. It was a very good day. I only walked about 2 miles. The cross is a fine cross for carrying…light. January 1, 2002 New Life Ministries, Bootheville, La. It was a wonderful day carrying the cross yesterday. 11 people prayed to receive Jesus Christ into their hearts. The wind-chill was around 36 degrees…. It was cold. But the Lord drew the people into His Kingdom, despite the cold. 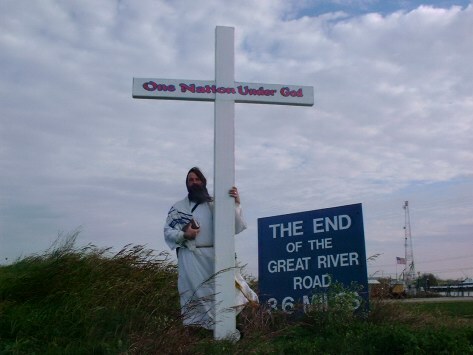 There is a sign along the road in Venice, that says “The End of the Great River Road: 3.6 miles”. I wanted Michelle to take a picture of me standing beside that sign. She dropped me off where I had finished my walk on the 29th, and went back to the motor home to get the camera and a heavier shawl for the walk. I got to the sign before she got back, so I stopped to cross the road to where the sign is. As I was waiting for the traffic to pass, a Viet-Namese woman in a van stopped and asked me very reverently if I wanted something hot to eat. I told her I was O.k., but thank you anyway, and I pray the Lord blesses you. She stayed parked in the road, blocking the traffic. She was looking at me with wonder in her eyes. I crossed the road to her van, and handed her a tract, and asked her if she was a Christian. She said she was, and I told her that I prayed that she would have a blessed New Year. I thanked her for her offer, and because the traffic was being backed up, I walked around her van, and stood my cross up beside the sign. She drove away slowly, in wonder, it seemed, at what she had just seen. I stood beside that sign, and was very blessed watching the reactions of the people that drove by me. Eventually, Michelle pulled up, and parked on the side of the road across the street from me. As she was getting the camera ready, and the kids situated, another car pulled up behind her. It was a woman who had a video camera, and she started taping me from her car. I raised my voice, and told her what I was doing, and explained the purpose of the prayer walk. Eventually, she got out of the car, and walked up to me, still recording me on her camera. I asked her name, and she said it was Bonita. I then asked her if she had any prayer requests. She asked me to pray for her and her two children, that she could raise them right. I asked her if she was a single mother, and she said, “no, but my husband isn't always there.” I then asked her if she was Born Again, and she told me she was, and that she went to Mount Olive Baptist Church. She told me that her husband was saved as well, but he was in a back-slid state. So I prayed for her walk with the Lord, that she would grow stronger in Him, and for her children, that she would raise them in the wisdom and admonition of the Lord, and for her husband, that the Lord would convict him and bring him to a point where he would come to his senses, and realize that it is better in the Father's House, than wallowing with the swine. After I finished praying, she asked me to pray a blessing on her pastor, which I did. Soon she left, and Michelle took the pictures that she had come to take, and I began my walk again. “Well, the Bible says that if God's people that are called by His Name would humble themselves and pray, and seek his face, and turn from their wicked ways, that He would hear their voice from heaven, and would heal their land. Our nation needs healing, so I am walking from the mouth of the Mississippi to the source in Northern Minnesota, praying that God's people would get a revelation of the necessity to get back to Him in Truth. I am praying for the Nation, that our land would be healed. And in the process, I am also telling people that stop that they need to get right with God as well. ”God knows all about you, Jason. He has a plan for you, and so does Satan. Satan's plan is very simple. He just wants to keep you from finding out what God's plan for your life is. God also knows when your time is up. He knew you from the foundation of the earth. And he has a set time for your life, and for mine, and for everyone's life. You may live many years before you die, or you may only live a short while more. Only God knows how long. Satan wants to side track you so that you won't make it into God's Kingdom. Jesus said unless we are Born Again, we cannot see the Kingdom of God. Satan is jealous of God's Creation. He wants to drag as many people down as he can. “Then let's do it now, Jason. I looked back and saw an older lady coming down the road toward me. So I turned around and walked up to her. Jason drove away. Her name was “Miss E.....”. She told me that she was born again, and she told me that she had wanted to visit with me when I was walking the other day, but by the time she got to where she had heard I was, I was gone. We visited for a while, and I asked her if she had any prayer requests. She asked me to pray for her sons. I asked her if they were born again, and she said she didn't believe they were. So I prayed for her sons, that the Lord would do a work in their hearts, and that they would be drawn into His Kingdom. While we were praying, I heard someone come up beside us, and I knew in my spirit that it was the police. But I kept on praying, and after we got done, she tried to give me a couple of dollars. I told her that I didn't want the money, that I just wanted her to be blessed. The officers respectfully waited as I ministered to Miss E.... Then as she turned to go away, I turned my attention to the officers. They asked me where I was from, and I circumvented all of their questions by telling them about the ministry that the Lord had called me to. “O.K.,” I said, “let me pray for that right now.” I bowed my head, and prayed for the Lord's protection on them, and for good health for them both, and that the Lord would draw them both closer to Him. After I was done, I asked them if they were born again. Leon nodded in the affirmative, and so did the other one. I told them it was very important for the line of work they were in. They both politely thanked me and told me to keep safe, and went their way. A little way down the road, I heard someone calling me. I looked around, and saw no one, then I heard them call me again. Looking around some more, I soon saw two men beside a building across the road from me. They were waving their arms, and yelling for me to come over. I headed across the road, and a car pulled up and I ministered to the woman and the man that were in the car. I spent fifteen to twenty minutes with them, and prayed with them to receive Jesus into their hearts. Then I turned my attention to the two men who had called me over to them, and I walked over to where they were standing. Their names were Troy and Curtis. We had a very lengthy conversation. Curtis confessed to me that a stronghold in his life was lust. And Troy confessed that he had received Jesus Christ in Prison, but had since backslid away from the Lord. They asked me a lot of questions about my view on what had happened on September 11th, and about how I minister and support my family, and what did I think about the fact that there were so many denominations. I would answer their questions, and then get back to the subject of the state of their souls. Eventually, they both expressed an interest in asking Jesus Christ into their hearts. So I prayed with them, and encouraged them in the Lord. As I was closing up with them, a van pulled into the parking lot, and right after it, a car drove in. I said my good byes to Troy and Curtis, and walked to the man in the car. He asked me if I needed anything to eat. I told him I was O.k., but asked him how he was doing in the things of the Lord. He told me he was not yet born again. I explained to him what it meant to be born again, and while I was explaining the plan of salvation to him, a crew-cab pickup with about 8 people drove up. THANK YOU JESUS! The man's name was Randy, And he soon prayed with me to receive Jesus Christ into his heart. I spent a while encouraging him to get plugged into a church, and getting discipled. He got back in his car, and dragged his left leg in. He explained that he had had a stroke, and it left his left leg paralyzed. I asked him if he minded if I prayed for his leg, and he let me. I prayed the Lord would heal him for His Glory. He started up his car to leave, and I turned my attention to the pickup, and the lady that had come from the van and stood beside the pickup. I asked them if they were born again, and the lady from the van and two in the pickup told me that they were. The others said they weren't. Two of those who were not born again were older, and another one looked to be in her twenties. The son said “I talked to you about three years ago in Grand Isle!” I said, “Yeah, I get around a little, man. I shook his hand and his friend's hand. 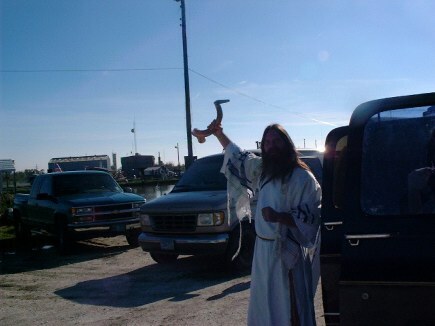 Then I proceeded with the gospel message to this small crowd that had gathered. They all gave me their full attention. After I was done, I asked who would like to give their heart to Jesus. Miss E....'s son, his friend, and three ladies in the truck all said they would. So I had all of us join hands, and led them all in a prayer. Glory! Miss E.... was overjoyed. So were the angels in Heaven. Last night I brought in the New Year at Mount Olive Baptist Church, with the reverend Theodore Turner. The church was packed. I had the privilege of bringing in the New Year with a large crowd of my African American brothers and sisters. Bonita was there, as well as another brother “Raf”, who had given his heart to the Lord at New Life's Sunday Morning Service. The racial walls have to come down if the Lord is to heal our land. It's raining today, and I have had a good time of fellowship with the pastor, brother Duke Chance. It was a wonderful day. I prayed with three people to ask Jesus into their hearts during my walk. I walked 41/2 miles. I also got to encourage some Christians who loved the Lord. Louise was one of the Christians I was able to encourage…she told me that she had been at a restaurant, and there were some people there who were talking bad about me. They said that I was a nut, walking around, thinking I was Jesus. But there were two police officers there who spoke up for me and said they had talked to me, and they said I was o.k., and that I didn't think I was Jesus, and I was doing a good thing, praying for our country. Praise the Lord! Tonight, brother Duke and I were talking, when Michelle stuck her head in the church and told me that there were some people looking for me. Brother Duke and I went outside, and there were two women, Trudy and Sandy (sissy), and two children. Sandy was a backslidden Christian. She had gone to brother Duke's church for several months, and then fell away. About three days ago, she had done some bad drugs, and had been experiencing some terrible things, like hallucinations and demons looking at her through her window. Her boyfriend was also having a bad experience with the drugs. Her mother had told her to go to New Orleans to a psychiatrist, and they were about to go, when one of the children told her that she had seen Jesus walking down the road today. She told her maybe she should go see Jesus. Trudy told her that it must be the man that is parked at Brother Duke's church. They thought they would come and see me to get some help. Brother Duke and I ministered to both of them, and they both were restored to the Lord. Then we went to their house, and ministered to the two men there, admonishing them all to get their lives right. The two men prayed a prayer of repentance. Then we prayed for the house, and the souls there. It was a wonderful night of deliverance…I am too tired to go into great detail. But a total of seven people got saved today. I praise the Lord for His Grace. Sunday, January 06, 2002 New Life Ministries, Boothville, La. 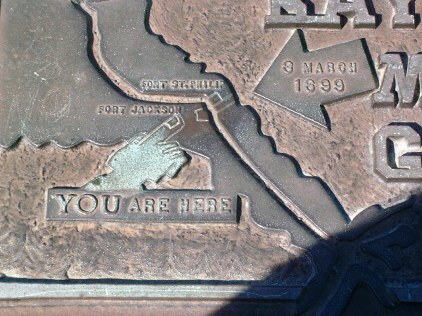 Yesterday we had our family day…we went to fort Jackson, and explored the fort, and learned of some of the history there. 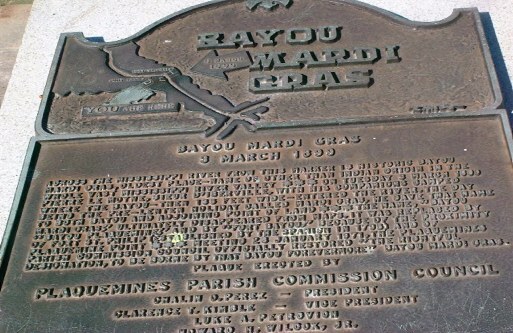 One thing of great interest to me was the fact that the first Mardi Gras festival was held in a bayou by D'Iberville and his men, right across from where fort Jackson stands. I took some pictures, and thanked the Lord that He had shown me a direction to pray. Last night Sandy and her boyfriend and her children came to visit, and I was able to encourage them in the Lord. Today is Abigail's first birthday. Thank You, Jesus, for my wonderful family. January 7, 2002, New Life Ministries Boothville, La. The night before last, I had a dream. Mel Rolls had his camp as usual for an out reach at Mardi Gras. But for some reason, the people where he had his camp told him he couldn't be there any more. A brother I know told Mel that they could set up their camp at his parent's house, which was big enough to sustain anyone that went. Mel said that would be great. M.... told them he would lead the way. I followed M...., and he was driving fast down the road, and I could barely keep up with him, but once in a while I would catch a glimpse of his van ahead of me. Soon we got into this residential area, and I wouldn't have found the house, if someone hadn't backed a car into the street, and then pulled back into the gate where the house was. The house was a mansion. M...'s mom and dad were there, as was M....'s brother. But after some time had passed, the people from Mel's camp weren't coming. I told M.... that they probably couldn't find the place, because I had a hard time following him. I told him I would go and find the people and bring them back. I drove down the road, where i found everyone waiting beside the road. I told them that I would show them the way, and pulled out slowly, and watched as a huge procession followed me as I led them to where we were supposed to go. Then I woke up. Mel Rolls' camp represents those soldiers in the Lord who want to do out reach. M.... is an example of an evangelist who is running hard for Jesus. He is running so hard he hasn't taken the time to show others the way to evangelize. We can invite others to our Father's house, where there are many mansions, but we need to show them the Way, as well. My walk is not to be in a hurry, but to equip the church in anyway possible. Yesterday brother Duke said he is starting a discipleship class to be held every Tuesday night. During church service, I prayed with Brigette to receive the Lord…she is Andrew's mother. 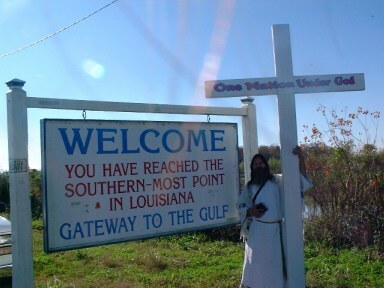 I mentioned crossing the river to Bayou Mardi Gras to brother Duke…I said I would like to go over there and claim the land for Jesus. January 9, 2002 New Life Ministries Boothville, La. Wonderful Jesus! I was literally swamped by people yesterday. I know at least 16 souls asked Jesus to come into their hearts. Before I walked, I met the pastor of the Assembly of God in Triumph, Max Latham. He has a heart for the people of God to turn to God, and to see this area down here changed for the Kingdom of God. We had a wonderful visit. He informed me that a group of Christian Native Americans came down to pray for healing of their land. They had gotten the vision to pray on the Mississippi River. Lord willing, I will get more information about that. A group of local pastors and some of their congregations had gone to the mouth in boats 2 years ago, and prayed at the gates. When I told him that was also my desire, he lit up. He was almost weeping when he told me how there had been such a show of unity for a short while, but when people weren't seeing immediate results, they would get discouraged, and forget about it. I told him that I had been to Fort Jackson, and had read the plaques about bayou Mardi gras. I told him I was planning on going over there and praying against the spirit of Mardi Gras that had been rooted over there. He lit up, and told me that he was led to go to Fort Jackson shortly after they had put up a plaque honoring Mardi gras, and when they went there to pray against that spirit, the plaque has fallen and it was broken. He told me that is why it is laying down instead of standing up! Praise the Lord! Prayer has gone forth for this nation and this area. But the thing that is missing is active evangelism, and diligent follow up, and the church is not equipped to go out and take the land for the Glory of God. I believe that my part in this whole thing is to equip the church. Pastor Duke and brother Andy and maybe some others are going to Bayou Mardi Gras tomorrow, to reclaim this land for Jesus Christ. This is the plaque that had fallen down and broken into two pieces. This is a mockery of Jesus, Who is the King of kings. 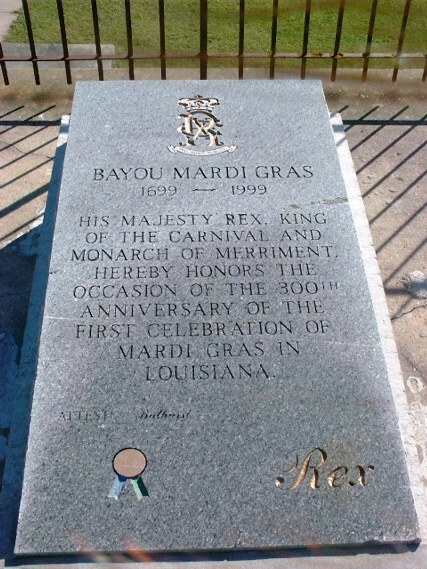 The head of the Mardi Gras festival is said to be King Rex. Rex means King in Latin. Before I walked, I went to see brother Max, and told him of my vision to go and pray at Bayou Mardi Gras, and to plant a Christian flag there in the Name of the King of kings, King Jesus. He lit up, and said he would go with us. I gave him a copy of a prayer the Lord gave me for this occasion. I intend on burying it in the ground there. On the next page, you can see the prayer.